I spent Saturday morning cleaning the mess I call a home, so later in the afternoon I thought I'd treat myself to some yarn goodies and lunch with friends!! We headed to our local LYS where my girlfriend picked up this really nifty sweater stone. 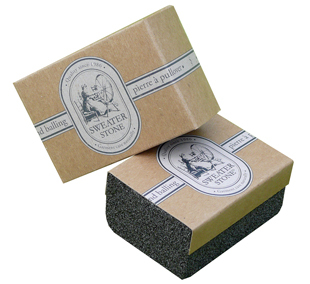 It's a natural stone that removes those annoying little bits from your sweaters and hand knits. It works like a charm and is definitely worth it's weight in gold for saving some of those older knits that you just can't let go of yet!! I also picked up these beauties! This beautiful yarn is made in Italy. I loved all the different textures this yarn provides (Polyamide, Wool and Polyester oh my). I think it will make for an unbelievable scarf or wrap! This yarn is a Louisa Harding special! So soft and delicate. I'm thinking a nice scarf﻿ for mom since the weather is cooling down. She'll love it!! What do you think?